I made an appointment to see the GP for her 6 week check up and also to check on some rashes on her face. When we went in to see the GP, he says she is only 5 Week + 1 day (hence Week 6, but not 6-Week) and if he checks on her now, it's not very accurate. Fine, so I told him we can reschedule to come back the next week. I then showed him the rashes on Shean Wenn's face. Initially, I thought like me, she was intolerant to the lactose in the formula we are feeding her and hence, was developing these symptoms. Asking me if she is having normal poo ("Yes"), the GP diagnosed that the rashes on her face were not due to lactose-intolerance but due to fungal infection. We need to only keep her face dry and apply the hydrocortisone cream that he'll prescribe. I was relieved! Shean Wenn's rash on her face. Poor baby girl! After 3 days of application, we noticed a marked improvement on her face. So while I fed baby, the FIL & MIL went shopping on their own. They had a very eventful day shopping, I must say!! Just before leaving, I popped into Zara and found a nice piece of top. When I went to pay, the price was discounted even more. What a steal! I love sales..
Ahhh.. and at the end of a very very tiring exercise session, Shean Wenn is elated with playing with her toys! Loving these moments! Must put her back into her capsule, seems like she is not ready just yet to go into her stroller without the capsule (carseat that attaches onto the stroller). So, someone else beat me to it! Well, c'est-la-vie! At least I get to see this cheeky smile (and a wink) which melts my heart. 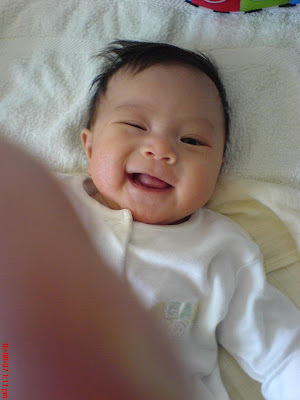 Shean Wenn's in a very good mood this morning. 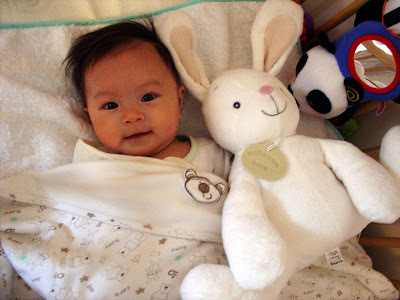 I put her down on the sofa bed, with her toys next to her - she gurgled to herself "Goo.. Anggoo.. Whooosh.. Googe", she smiled at the toys, waved and touched them, she also listened intentively to Bach & Mozart while daydreaming (of milk & sheep?) .. for a full 20 minutes! Then, she cried out for me, only just awhile. I finished up my breakfast (waffles today) and went to her - I spoke to her, telling her daddy will be buying her a playgym soon, .. and a rocker. She smiled. I sang to her and made silly gestures - she was entertained! She laughed and smiled, kicked her legs up in excitement and gurgled more. I even tried to clear her nose. She didn't fuss - just moved her head in annoyance. She even smiled at me after I finished. How charming! Then she decided she's tired from all the activities and cried to want to sleep. I cuddled her in my arms whispering to her to sleep - and she did, in less than 5 minutes. She dozed off while I'm yapping about "be a good girl and sleep by your own, darling". ps: Thanks Tsu Yen, for pointing out the confusion in months. Geez.. 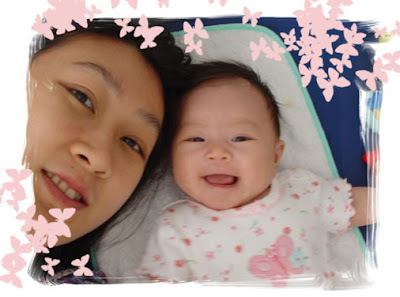 Taking care of a baby really is hardwork, so much so that I get my months mixed up! * Coos - can respond when you talk or sing to her. * Hits at toys when you put it near her. * Enjoys listening to music (I usually sing to her). * Still gets frustrated when she cannot latch on properly at times and shows it by grunting and shaking her head in frustration. * Will smile when you "baby talk" to her. * Can lift her head for longer when put on her tummy, a sign that ner neck muscles are getting stronger. Caught in the act! (Week 3) Noticed her rashes on her face getting better? Week 5 was the week I ventured out with Shean Wenn. Ventured out meaning bringing her out in her stroller. The first day we ventured out, it was with MIL & FIL at the nearby retail park. We left the house after lunch and made sure tht she was well fed. We packed the diaper bag and load her into her little "capsule" (car seat). The drive there takes less than 5mins and we got out and FIL & I then struggled to open up the brand new stroller! It was certainly was an exerise both mentally & physically for me.. But we finally got it up & working. Shean Wenn in her "capsule"
We then went shopping! I even managed to shop for shoes and some clothes. Bravo for me! Shean Wenn, on the other hand, was also a happy camper - blissfully sleeping in her stroller. She did wake up a few times and cried but we just gave her the dummy (pacifier) and she went back to sleep. It was truly a big stepping stone for us (Shean Wenn and I). I never thought I could handle her outside. But I also have MIL & FIL to thank, for they kinda guided me on what to do when I am out with baby. Now (week 6), going out is getting easier with her although I don't know if I'll be able to physically handle her if I go out with her alone in the future. Her car seat itself weighs like a tonne to me, not to mention my bad back will not be able to handle all this. Well, I'll cross the bridge when I come to it! A happy mom with her new shoes she found! Sun after full moon : and a long needed haircut! Shean Wenn & I having a good time at aunt Alicia's pad! On Sun, a day after Shean Wenn's full moon, we spent the day at SIL Alicia's pad in the city. Meng dropped the FIL, MIL, baby & I at her place late morning before going to the office for some work. I've also asked SIL to schedule a much needed hair appointment at her usual stylist's place (which was conveniently located just outside her apartment place). When we arrived, we spent some time chatting and Alicia brought out chocolates she got from New York. All the yummies I cannot resist! Here's one of Reese's peanut butter (which reminds me of Mavis - I was thinking abt you when I was eating it!) minicups. It was WAY too sweet for me :P She also let me sample some green tea ones which was my favourite of the lot. Needless to say, I helped her finish her bar of that green tea chocolate. It was only a small bar (I need to declare this incase mum is reading this. I AM controlling my glucose, don't worry). Afterwards, Shean Wenn decided that she was hungry so it was time to feed her. The 3 of them - FIL, MIL and Alicia then went off to a Farmer's Market nearby. Lunch was a lovely affair at a Chinese Restaurant nearby, and this's when and where I discovered the yummiest pau - apparently it's a new "cuisine" (Is it entitled to be called a cuisine?) in Hong Kong - inside it is a mix of custard and salted egg-yolk. The combination of sweet & salty is just right and lovely. You gotta eat it to believe it. It was like tasting heaven (almost). :) I had 3 paus! Thanks Alicia for the lunch! Shean Wenn, on the other hand, full from her feed, slept through the whole affair. A few weeks ago, I received an e-mail from a Luke Ritchie, Managing Editor of Schmap Guides to inform that one of my Rome photos have been shortlisted to be included in their third edition of Schmap Rome Guide. It asked if I would give permission for the photo to be included electronically (online).